Bands can come and go in an MMMbop minute (we are using the term correctly, right?). But the Hanson Brothers (slapshot reference) have a couple good things going for them (that all other boy bands in the 90's didn't). They are extremely talented musicians, that have been playing together for two decades, and they're brothers! Their gift/curse MMMbop made them massively popular. You can't dis a band for selling 10 million records, and getting laid more times (unverified) more than most do in a lifetime (put that in your purity ring wearing pipe and learn something Jonas Brothers). It was label interest, and non-stop radio rotation that killed their song (and image). But these dudes aren't dead. Like any artist, they continue on, regardless of public opinion. Talent will always trump the sands of time. 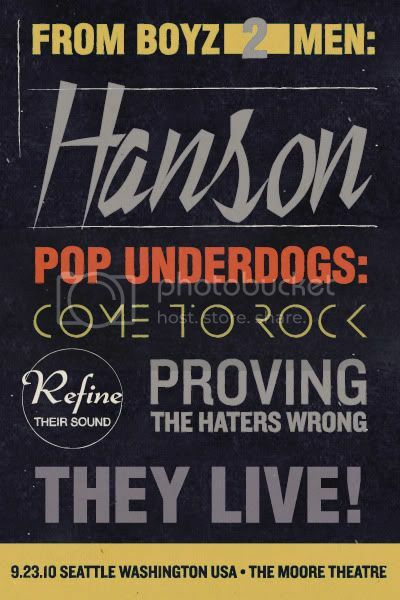 Hanson is playing at The Moore on September 23rd, 2010 in Seattle Washington USA.